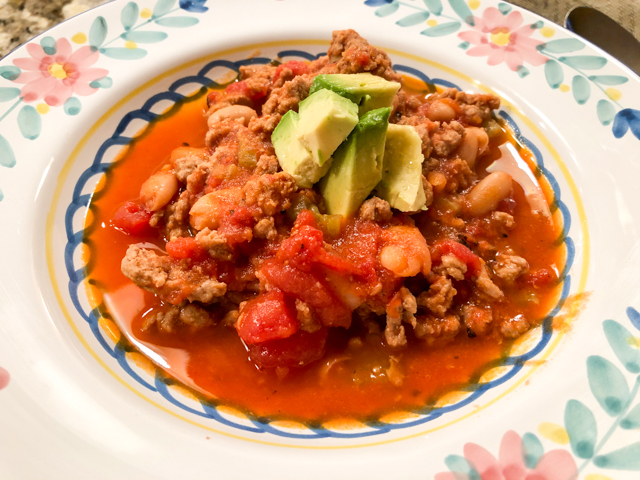 Thanks to the wonders of pressure cooking, this chili can be on your table in 20 minutes, and I promise you it will taste as complex as one that simmered on the stove for hours. I used ground bison because we love it and it’s always available in our grocery store, but of course you can use ground beef or a mixture of beef and pork. I don’t think turkey will work well without some major adjustments because the meat needs to have some fat to stand the high pressure cooking without drying up. 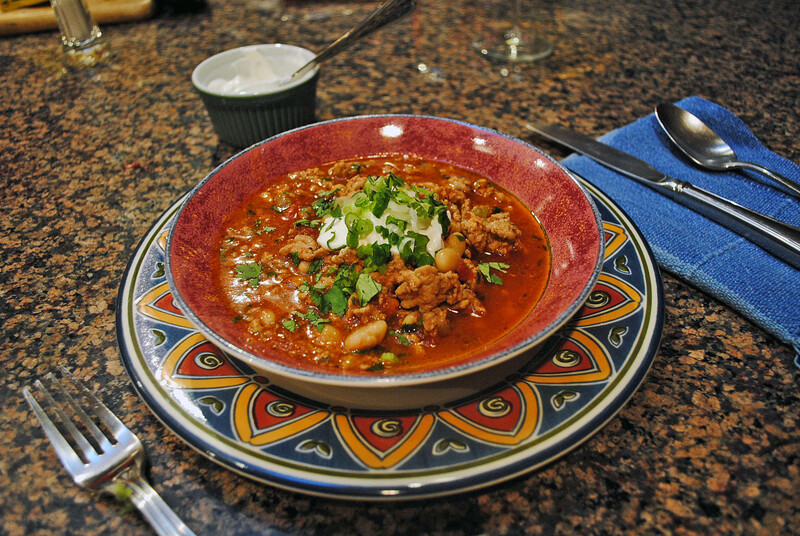 If you want to make this in a regular pan, simply increase the cooking time, use the method you normally do for chili. I adapted this recipe from several sources, using tips from cookbooks such as Hip Pressure Cooking and Pressure Cooker Perfection. For those interested, this recipe is Paleo-friendly. Not exactly low-carb due to the amount of tomatoes, but I’d say not that heavy in the carb department either. Heat the oil in a large skillet, saute the shallots seasoned lightly with salt. When they pieces are translucent and fragrant, add the chili powder and cumin, mixing constantly for a minute or so. You can do this initial step in the pressure cooker itself, but I prefer to use a pan with a larger surface. Add the ground bison and sausage, increasing the heat to high. Cook them until they are no longer pink, but do not let them get brown. Stir the tomatoes and water, transfer everything to the pressure cooker. Close the pan, bring the pressure up and cook under pressure for 12 minutes. Release the pressure quickly by running the pan under cold water in the sink or using another method available for your pan. Open the pan, if the chili is too liquid simmer for a few minutes until it reaches the consistency you like. If too thick, add a little more water. Taste for seasoning and adjust if necessary. 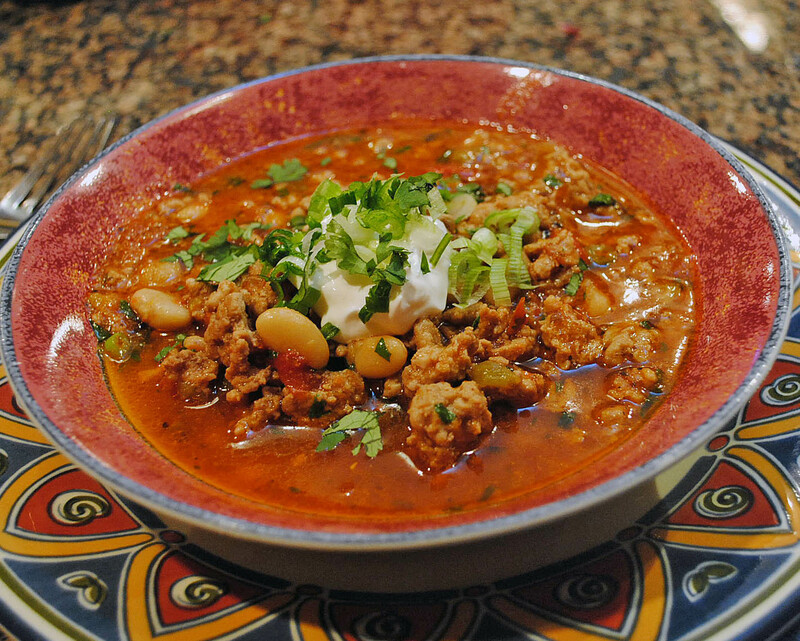 Chili in general is quite substantial, and this one is no different. I normally serve it with slices of avocado, a little grated cheese and call it a day. But of course, a piece or two of cornbread could go well too. 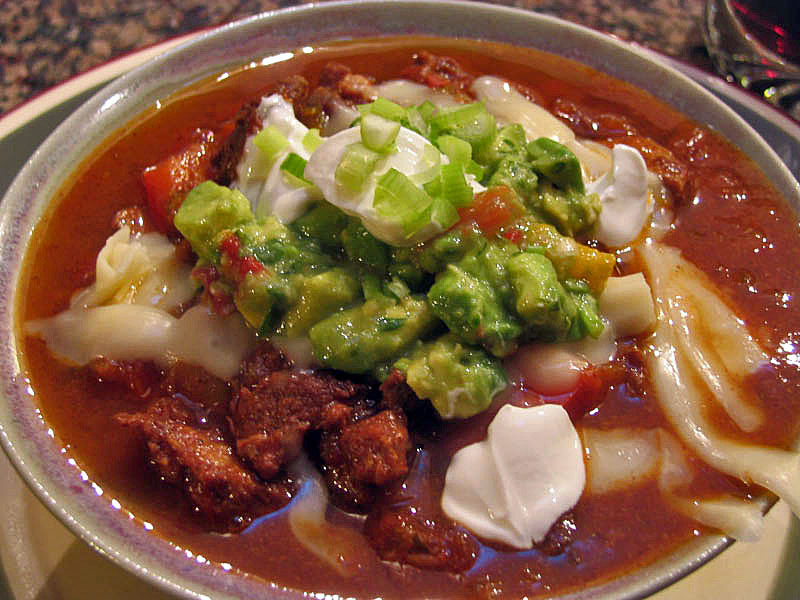 As usual with chili, you can make it furiously fiery by adding more chili, cayenne, maybe shake some Sriracha on top. Particularly with meat as flavorful as bison, we prefer to use a lighter hand with the seasoning, and added only one tablespoon of chili powder. It does get better with each passing day, I can vouch for that! The weather is cooling off and football season is warming up! Because our university team is ranked near the top this year every game matters, and they’re all nail-biters. This weekend brings the season’s most anticipated and exciting game, OU vs Texas. It’s a great rivalry, a grudge match for the schools, and every year both cancel classes the day beforehand so that students can drive to Dallas and watch the pageantry and festivities in the Cotton Bowl, surrounded by the Texas State Fair. I have mixed feelings about it. It’s a wild, wild adrenaline ride. But, sports attract too much attention and praise, relative to the pitiful amount given to academia and research. The coaches make so much money, making me painfully aware of how broke our academic departments are. It makes me wonder if the priorities aren’t a bit twisted. On the other hand, we all know what may happen if the University withdraws financial support from its sports programs. The TV revenues will drop, and the schools will have lower profits, resulting in even greater struggles for scientific research. Having failed to solve this pressing problem of the universe, I go back to food. 😉 … Ohhh, and I almost forgot: GO SOONERS! Football food. 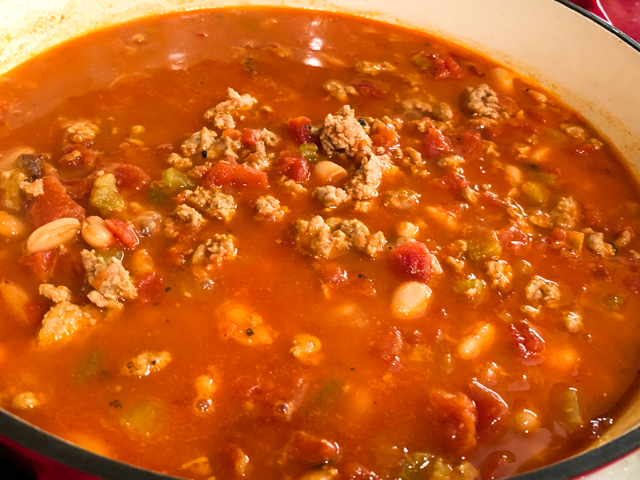 Several classic options come to mind: hamburgers, grilled sausages, hot-dogs, one-pot type meals like… chili! 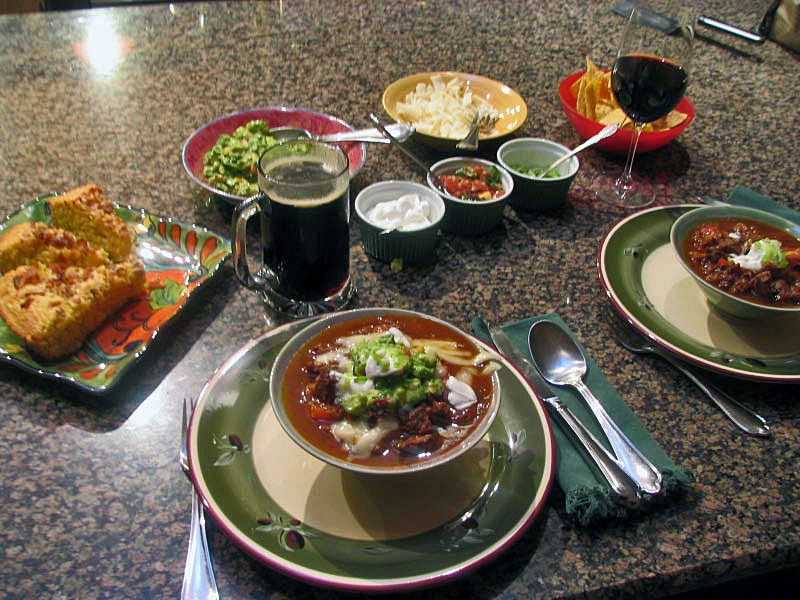 Once chili was mentioned, we reached a delightful agreement. I modified a turkey version from The Gourmet Cookbook, to showcase the colors of our team, crimson and cream. It was like throwing a 98-yard touch down pass! Puree the canned chipotle beans with the water in a blender or small food processor, Reserve. Heat the olive oil in a heavy pan, ad the shallot, saute for a couple of minutes, add the cumin, mix well and cook for another minute. Add the ground turkey, increase the heat, and cook stirring often, until browned, about 8 minutes. Add the chipotle puree, the canned tomatoes, chicken stock, bay leaf, oregano, and salt, and simmer without a lid for 1 hour. If the level of liquid drops below the surface of the meat, add more water. Add the red bell pepper, serrano chiles, and cornmeal, and continue simmering gently for another 30 minutes. Stir the white beans into the mixture, discard the bay leaf, taste, adjust seasoning, and right before serving add as much cilantro as you like. Serve with sour cream, sliced green onions, and shredded cheese on the side.